MANZANAR NATIONAL HISTORIC SITE, NEAR INDEPENDENCE, CA — Manzanar National Historic Site invites the public to participate in a weekend of special activities surrounding the Manzanar Committee’s 40th Annual Manzanar Pilgrimage. This year visitors will be able to experience music, paintings, a film screening, speeches, a book signing, and a public reception. All events are free. On Friday, April 24, the Independence Chamber of Commerce and the Friends of Eastern California Museum will host a public reception from 4:00 to 6:00 PM at the Eastern California Museum in Independence. Eastern California Museum’s exhibits include Shiro and Mary Nomura’s Manzanar collection, an exhibit on legendary mountaineer Norman Clyde, and the Anna and O.K. Kelly Gallery of Native American Life. Eastern California Museum is located at 155 Grant Street in Independence (phone: 760-878-0258) and is open daily 10:00 AM to 5:00 PM. At 7:00 PM Friday evening, the Beverly and Jim Rogers Museum of Lone Pine Film History will host a special screening of The National Parks: This Is America, a 45-minute film produced by critically acclaimed documentary filmmaker Ken Burns and Dayton Duncan based on their upcoming six part, twelve-hour series, The National Parks: America’s Best Idea, which will air on PBS in September 2009. A short feature, Manzanar – Never Again, will also be screened. It looks at the interconnected stories of Japanese American internment during World War II, the community’s efforts to commemorate Manzanar, and the ongoing work of Manzanar National Historic Site and the Manzanar Committee to educate visitors about civil rights. The Lone Pine Film History Museum is located at 701 South Main Street (US Highway 395) in Lone Pine (phone: 760-876-9909). The Manzanar Committee’s 40th Annual Pilgrimage begins at noon Saturday at the Manzanar Cemetery. The Pilgrimage includes guest speakers, an interfaith memorial service, and taiko drumming. The afternoon program concludes with the traditional interfaith service and Ondo dancing. Program details will be posted on the Manzanar Committee’s website at http://blog.manzanarcommittee.org. The “Manzanar At Dusk” (MAD) program begins at 5:00 PM at Lone Pine High School auditorium, located at 538 South Main Street (US Highway 395) in Lone Pine. The program will feature a screening of Ken Burns’ Manzanar – Never Again and participants will also have the opportunity to interact with former internees and each other. The MAD program is sponsored by the Manzanar Committee, Friends of Manzanar, the Paul I. and Hisako Terasaki Community Outreach Program Fund and Lone Pine High School. Manzanar History Association will host Joanne Oppenheim, author of Dear Miss Breed and Stanley Hayami, Nisei Son, His Diary, Letters, & Story from an American Concentration Camp to Battlefield, 1942-1945. Ms. Oppenheim will sign her books Saturday from 3:00 PM to 4:00 PM in the Interpretive Center book store. On Sunday, April 26, Ms. Oppenheim will present short talks at 10:00 AM and 1:00 PM on the lives of young Japanese Americans during World War II. Both talks will be followed by book signings from 11:00 AM to 12:00 PM and from 2:00 PM to 3:00 PM. In addition to the exhibits and award-winning film, visitors are invited to experience Manzanar History Association’s Selected Artists from the Henry Fukuhara Annual Alabama Hills and Manzanar Workshop art show and sale through May 3 on the Interpretive Center stage. The National Park Service has declared April 25th National Junior Ranger Day. “Kids of all ages” can receive a free Junior Ranger Activity Booklet consisting of a dozen activities that highlight Manzanar and the Owens Valley. While activities are targeted to children between the ages of 4 and 15, anyone is welcome to participate and earn a Junior Ranger badge and certificate. 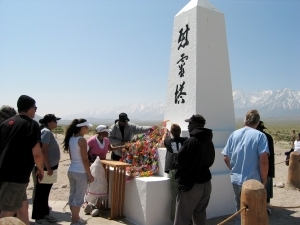 With the exception of Friday’s reception and film screening and Saturday’s MAD program, all events will take place at Manzanar National Historic Site located at 5001 Highway 395, six miles south of Independence, nine miles north of Lone Pine and approximately 230 miles northeast of Los Angeles. Nearly 500,000 visitors have experienced the Manzanar Interpretive Center since its April 2004 grand opening. The Interpretive Center is open every day from 9:00 AM to 5:30 PM. Admission is free. For more information, please call (760) 878-2194 or visit Manzanar National Historic Site’s website at http://www.nps.gov/manz.